Sometimes, even without overly generalizing, you really do need a broader brush; especially if you want to size Japanese washi. Those who have followed my occasional posts about my attempts to home-size Japanese paper to make it suitable for printing know that the biggest problem up to now has been finding suitable papers but that's slowly working itself out now that better papers are getting easier (a little) to find either outside Japan, or within it thanks to e-commerce or reliable paper sellers of quality papers in the US, Canada, and abroad (Hiromi Paper, The Japanese Paper Place, The Paper Connection, McClain's (although they sell high quality pre-sized papers for moku hanga), Intaglio Printmakers (UK) and Les Papiers de Lucas (France), and probably others I haven't found yet. But the biggest practical problem remains actually sizing the paper; figuring out suitable glue and alum ratios and recipes for my climate and the paper I'm trying to treat. (Size, or dosa in Japanese, is the mixture of alum and animal glue that is added to the paper to make it less absorbant). 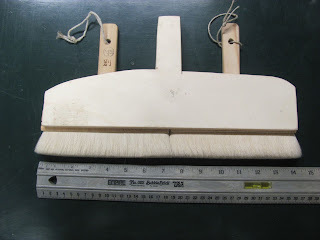 In Japan, the paper was traditionally sized on one or both sides of the paper and IDEALLY, the warm glue was applied with one quick pass over the sheet of the paper with a fully loaded brush. With a small brush it's hard to cover the entire surface without overlapping the edges from the previous pass and where the brush passes twice (or misses entirely) will leave paper unevenly sized that will show up when the paper is printed. 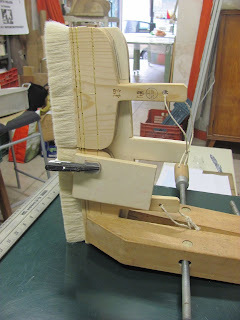 Getting the mixture onto the paper evenly without buckling or crinkling the paper or leaving gobs of size that will act as a resist isn't that simple a task but it's made easier by a bigger brush that holds enough glue to make it across the entire sheet in one go. 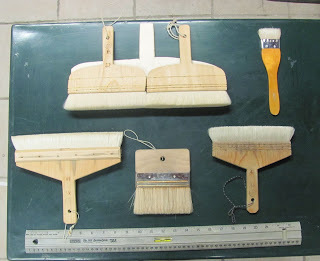 The only brushes I've been able to find actually made for applying size are pretty small at 2 to 4 inches across, water brushes for dampening paper are a little easier to find and I purchased a couple of 6" brushes a few years ago with the intent to try to put them together with a jig to allow me to create economically a brush sizing brush. 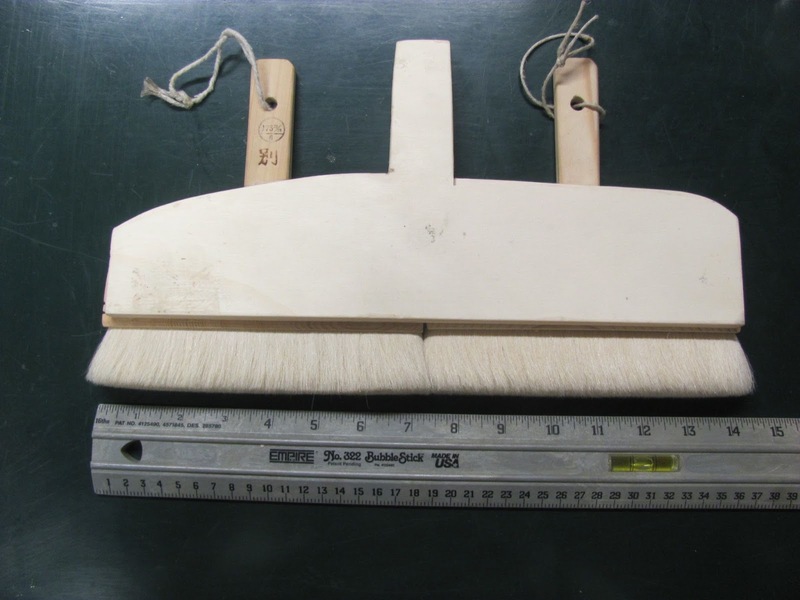 These are two "economical" Chinese sheep wool "water" brushes (mizu bake) that I'm going to be using for adding the glue and alum (dosa) to unsized paper to render it a little bit resistant to absorption and hence suitable for moku hanga, watercolor woodblock printing. 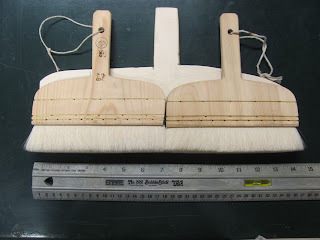 A real Dosa Bake or sizing brush--of this width, even if they were available-- would cost a few hundred dollars. This will end up costing about $50; since I got the two 6" brushes on sale from McClains Printmaking Supplies some time ago. David Bull posted photos of an Artist (in France?) who had actually already done so and the photo was just like what I had imagined trying to do--and he was home-sizing his paper with a large brush with two smaller ones glued onto it and with good results. David also confirmed that he too has made several and that they work well enough if one shaves back the wood to allow the brush parts to line up closely--so I decided to go ahead and try to put one together from the brushes I'd previously purchased. These two brushes are the same size and from the same manufacturer but they're not identical so I had to adjust them a bit so the brush ends would line up and remain flush. The two edges of the wooden handles were shaved down with a sharp chisel so the brush portions pushed against each other and with care to make sure the sheep's wool lined up as well as was possible they were glued and clamped one at a time with water-resistent PVA glue. I'll let this thing dry for a bit and have a go at sizing some 100% Kozo paper that I bought earlier this year. My new brush is 14" across, so I can size in one pass a sheet of about 15" X 30". 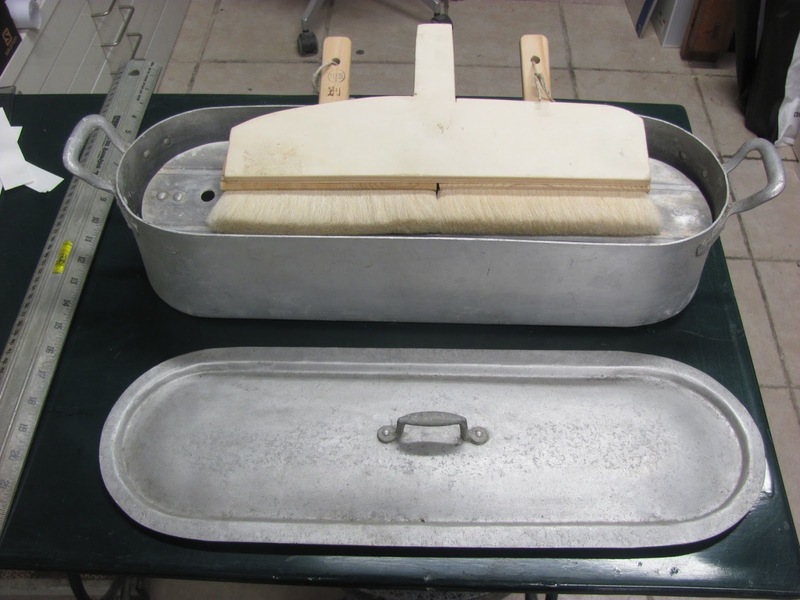 A trip to the basement revealed an old aluminum fish poacher and armed with my food warming, hot plate (1970's), Aluminum Poacher (60s? ), and "new" 14" dosa bake I'm ready to try another round of sizing Japanese paper for moku hanga printing. I'll let you know how it goes. Various water and sizing brushes that I've accumulated over time. Thank you Paperwomen for your kind words and attention. I'm always surprised to find out I actually have readers! Thank you for your blog, I always find useful tips. I have just started to experiment with sizing my own paper and have a natural bristle wall paper brush that I've been using. Great idea. I had never thought of a wallpaper brush but they're certainly wide enough. What kind of paper are you sizing? Good luck and let me know if it works on your paper, and if it does, your recipe/ration of glue/alum and show some samples?